Another 1000pt battle with PeteB, do let me know if you're getting bored with them. 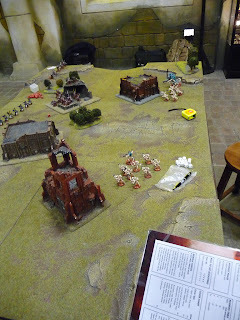 Vanguard setup with my first time playing Big Guns Never Tire. Four objectives, essentially one in each table quarter - hive nodes next to my prime manning the quad gun and between the mysterious forest, fuel drums in front of the bastion and the comms relay next to the cover my stealers and Ymgarls were dormant in. 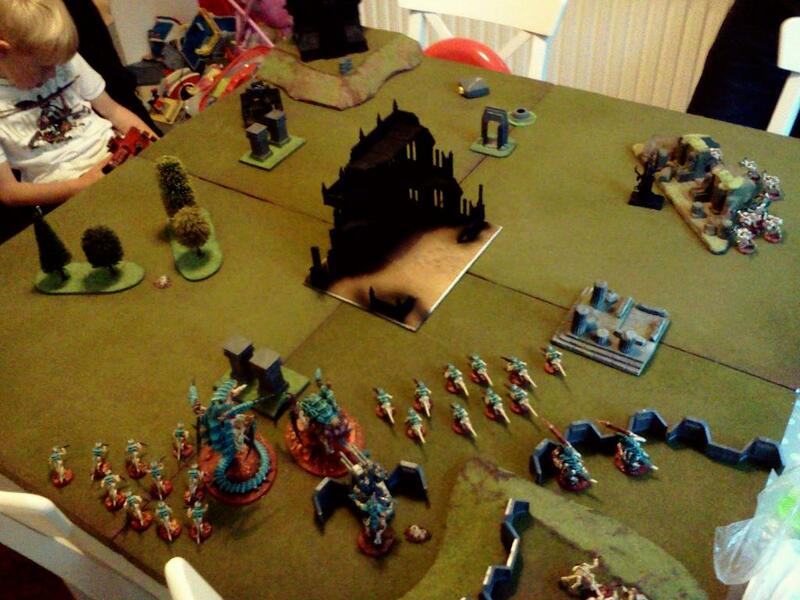 I had first turn and my Warlord had +1" to charge range, not sure what PeteB rolled. 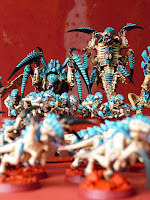 The Bastion and Aegis were not part of our list, just terrain we could use as per their rules, gives me chance to check out the Aegis ahead of completing my own Tyranid versions. 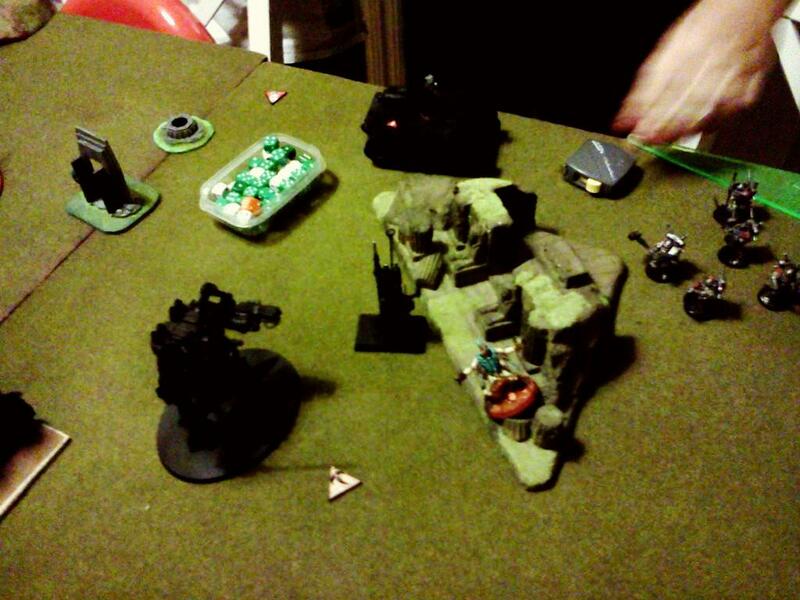 First turn advance towards the Razorback and the squad in the Bastion. 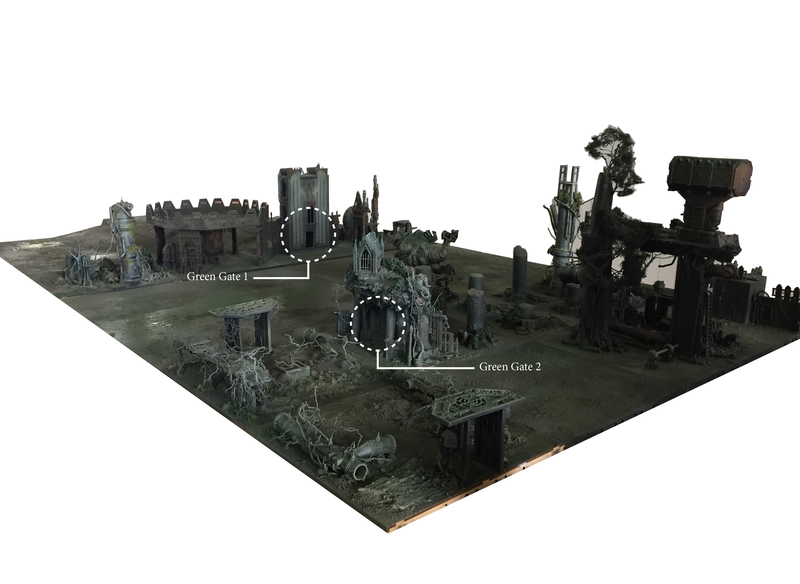 Tervigon spawns 7 or 8 and keeps on going into the ruins. 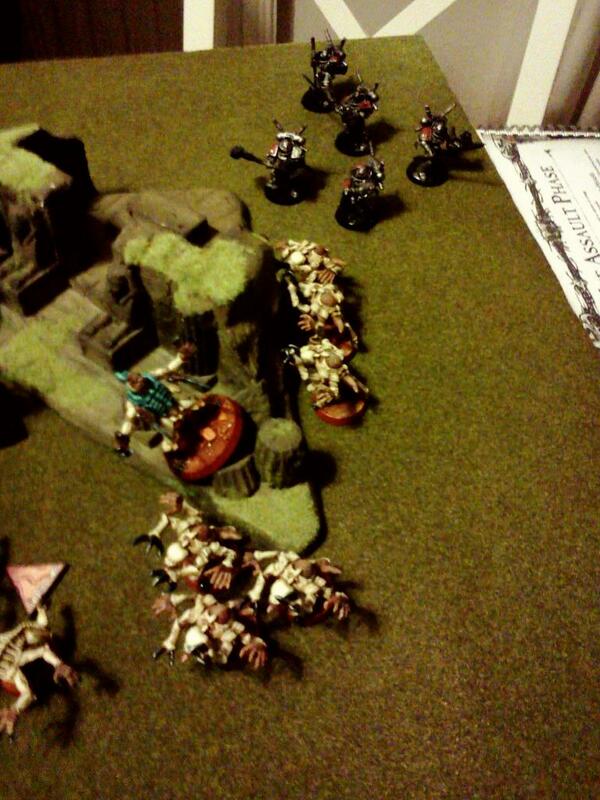 Hive guard are too far away but the quad gun fires at the unit in the Bastion, but fails to wound, bah. Stealers stay hiding. Hormagaunts, spawned Termagants and Trygon go up the left flank. Termagants enter the forest to find it is made up of Overgrown Spinethorn. PeteB did his move which was equally quick the Razorback, Bastion Heavy Bolters and Defence Lasers all targeted the Trygon which managed to whether the hail of fire and suffer just one wound. Turn 2, the Hormagaunts enter the second forest to discover it is made of Ironbark. 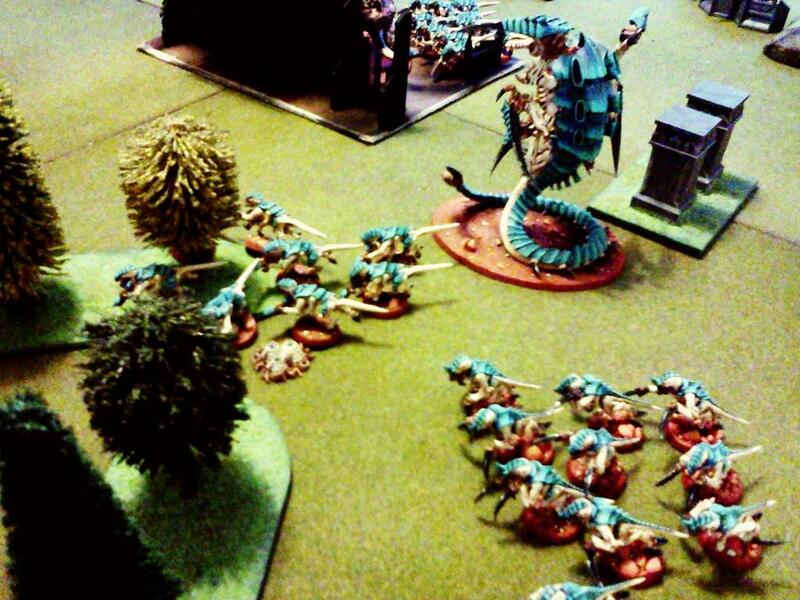 The Tervigon spawns 11 Termagants with still no doubles. They get projectile birthed throughout the three levels of the ruins and then the Tervigon smashes through the walls. 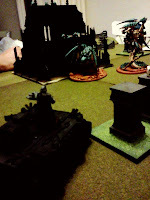 The Trygon moves up to support the Tervigon. I think the Tervigon tried to charge the Razorback but was too far away. The Quad gun fires again but does nothing. The Ymgarls woke up and sat in the cover. It was this point PeteB had an interesting discussion about where these should have been placed. With hindsight I should have had them in the pillars next to the Rhino. 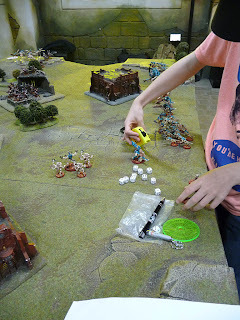 I was thinking too much about the games recently where Stealer out on their own have been mauled through lack of support but PeteB's idea made much more sense as they could have done what they were supposed to d, assault from cover in their first turn. 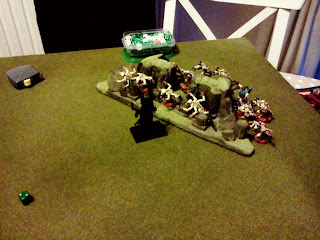 PeteB's turn two, a squad teleports in and scatter just in front or the Hive Guard, they open fire with all guns and kill one Hive Guard and wound the second. 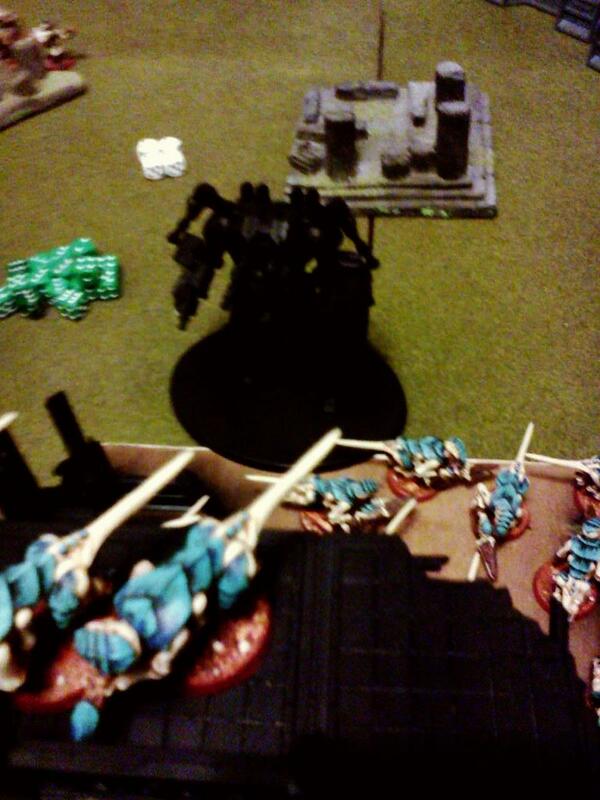 His Nemesis Dreadknight teleports in, scatters but doesn't suffer a wound. 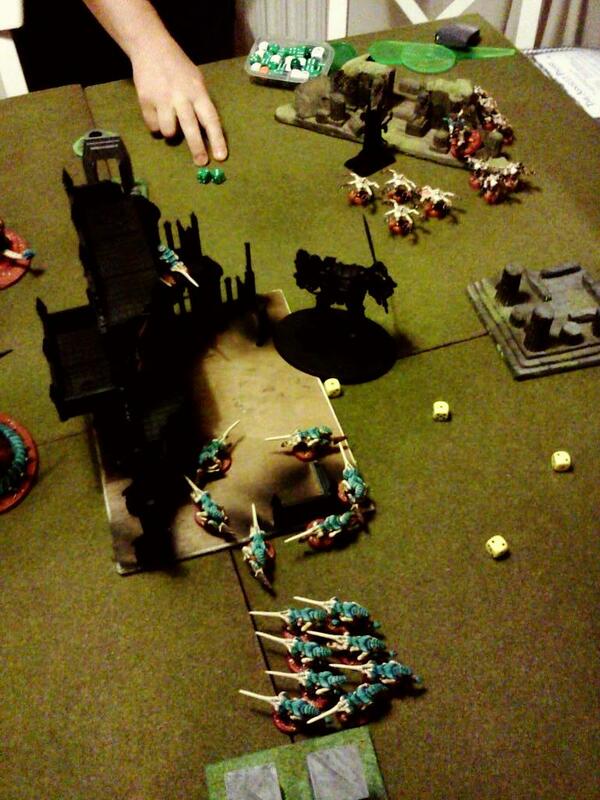 He opens fire with his flamer and the Devgaunts don't fair well with 4 of their number BBQ'd. 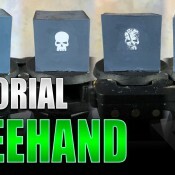 Now I have to decide what to do, the Prime needs to take the immediate threat and abandons the quad gun. 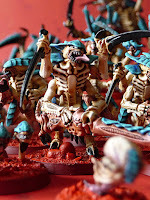 The Hive Guard moves further back to help delay any charge but still give it target options of the NDK or the squad. 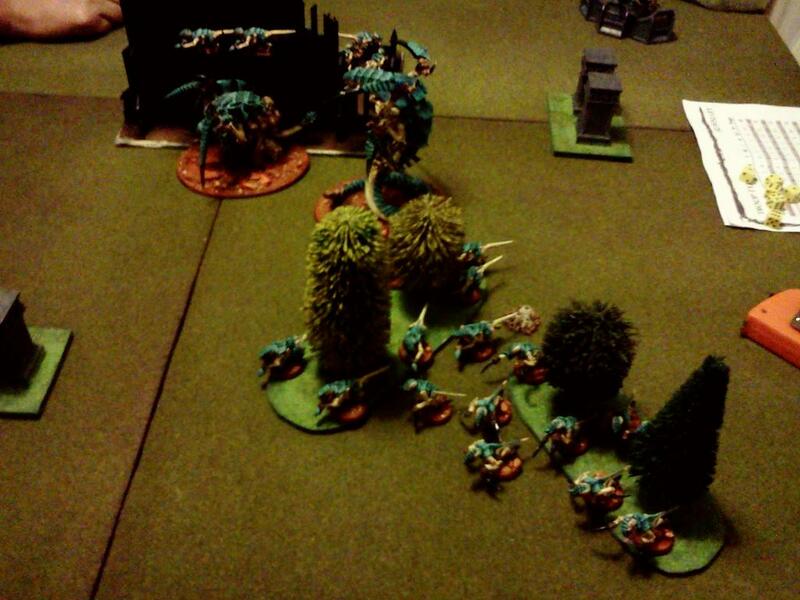 The Devgaunts target the unit in front and take out 3 or 4 but don't manage to break them. 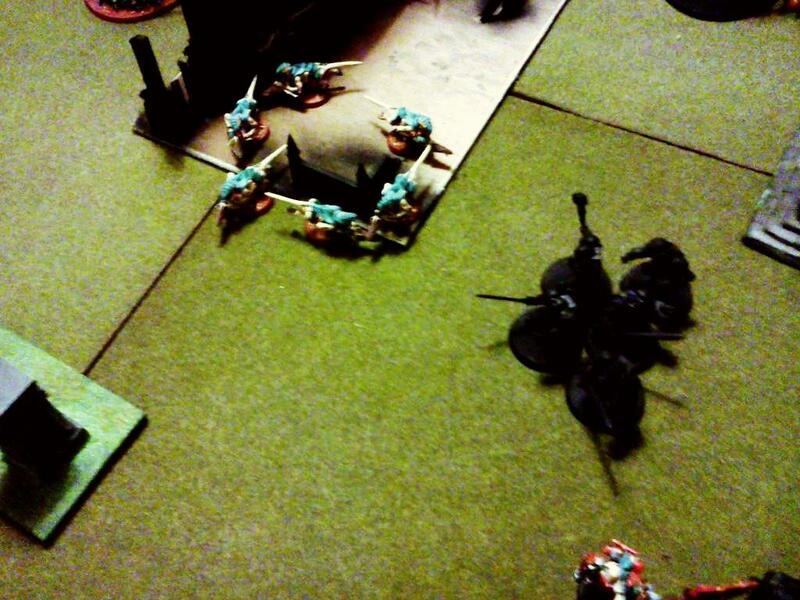 The Hive Guard takes a shot at the NDK but it's armour shrugs off the impaler ammo. The Prime charges the unit and the leader challenges me, saving the rest of the squad from his Boneswords but as you can see he either failed to hit or wound as it was 3+ for both, so much for protecting his comrades. 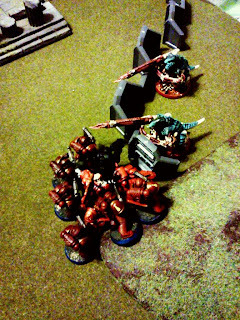 The Tervigon spawns 8 more Termagants and poops out, they're fired from it's belly towards my deployment zone so they can get back and capture my objective. 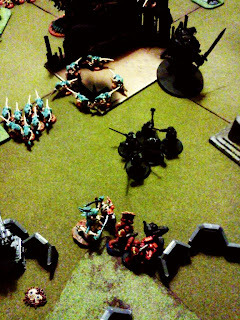 It finally reaches the Razorback but only manages a couple of glancing hits. 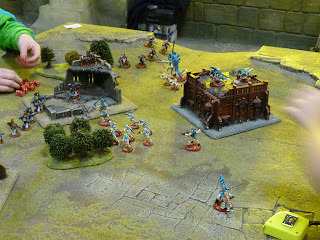 The Ymgarls and Stealers sally forth to target the Dreadknight but not before the Termagants in the ruins do the same. All three units fail their charge range, the most frustrating being the Ymgarls as they fall an inch short due to their frontrunner being mown down by overwatch. 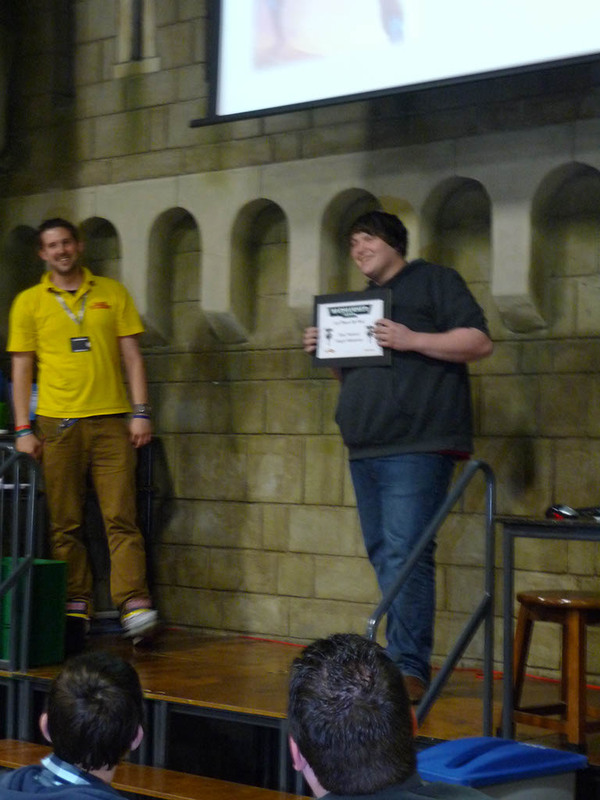 This was a major disappointment for me. It wasn't particularly 'bad luck' which I don't believe in but the failure of almost every element of my attack to achieve just something started to weigh heavily on my morale. The unit of knights in the bastion had moved out last turn behind the Razorback and here they 'shunted' behind my stealers, their flamer and storm bolter fire leaving just the Broodlord with one wound left after this shot. It was going from bad to worse. 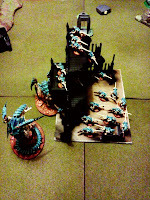 ... and incinerated the entire unit of Termagants. And even more worse! Oh, did I mention that was first blood, and again worse. At this point my phone battery ran out. 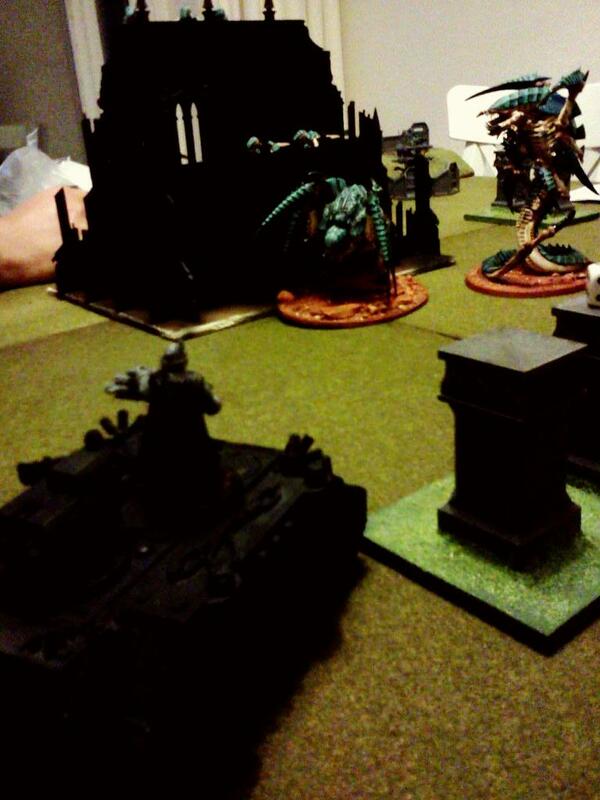 As expected the Broodlord took out the Razorback, the Tervigon and the Trygon assaulted the NDK. 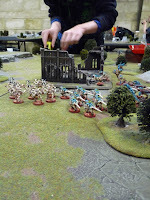 None of their Hammer of Wrath's did damage then the NDK called out the Tervigon in a challenge - I didn't see that coming. It declined so could do nothing the Trygon assaulted and added a wound or two to the NDK. 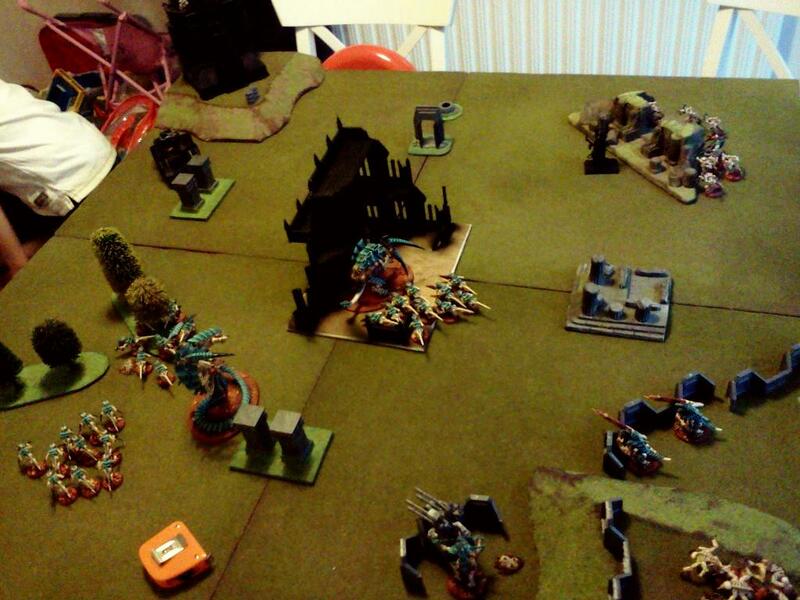 In return it put three wounds on the Trygon which was now at 5 thanks to more autofire from the Bastion. The Prime managed to take out the sergeant or justicar and managed to rout the unit slaughtering them all - success finally. The Hormagaunts headed towards the barrel objectives, and the Termagants in the woods hid in the Ironbark for cover. The Devgaunts hot-footed it back to the Quad gun objective securing that post with the Prime eventually getting back to the Quad gun and opening fire on the terminators who were eventually destroyed. The monstrous assault continued but this time the Tervigon accepted the challenge but hit second due to Initiative. The NDK had already suffered one wound trying to activate his force sword thanks to Shadows in the Warp. 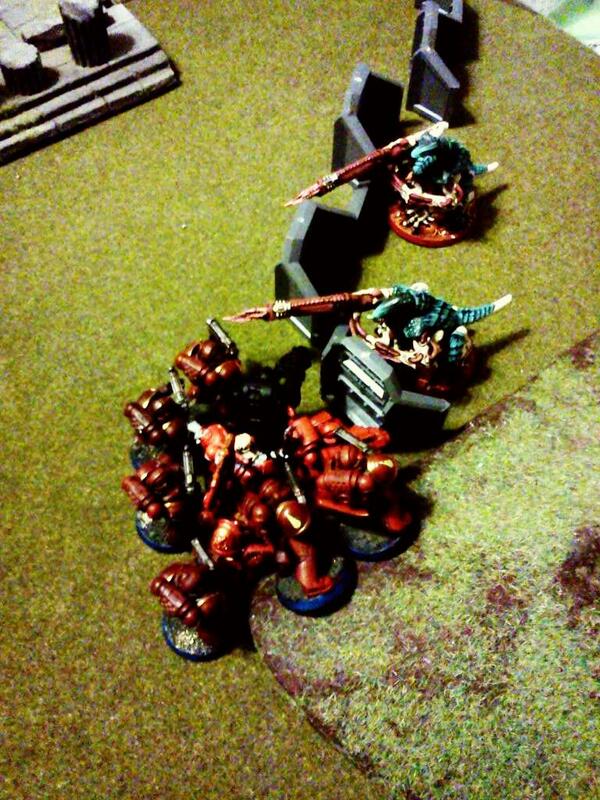 Having wounded the Tervigon it gambled again and it paid off slicing the Tervigon dead with one mighty stroke. The following turn the Trygon and the NDK got angry and killed each other and when it came to turn 5 the game was over. Despite my 'bad luck' and heavy losses I'd managed to win due to the capture of three objectives - 9VP, Line Breaker and killing his heavy support. PeteB got 3VP for objectives, First Blood and killing my heavy support. 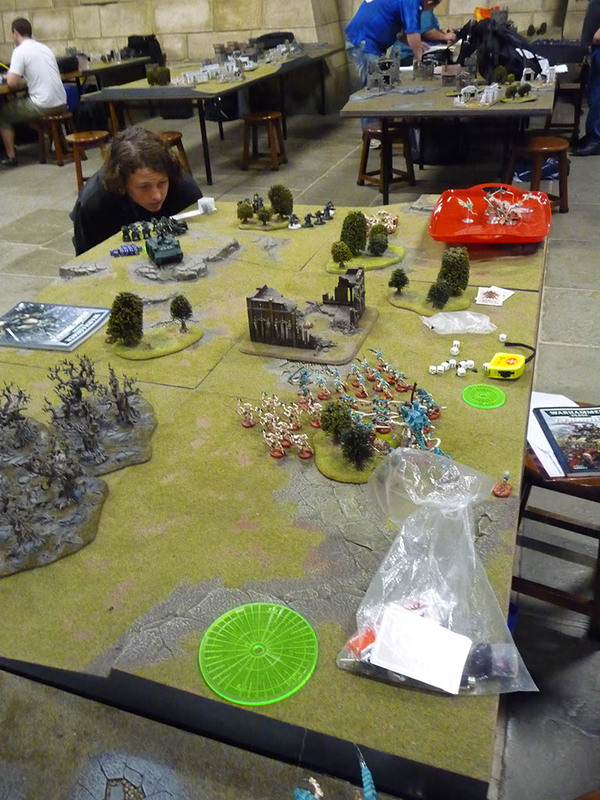 It was good game, though I having seen so much failure I don't feel my win represents how outgunned I felt. 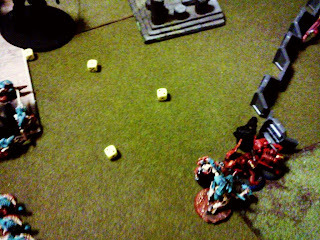 PeteB felt the opposite though pointing out I had so many scoring units it suddenly became impossible for him to tackle everything. It's just different to go back to an objective based game. Suddenly I'm doing what I've geared myself to do and it feels wrong considering all the Purge the Alien games. 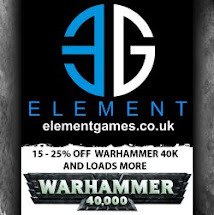 So lesson to learn is really how to use Genestealers and Ymgarls now, or not at all! 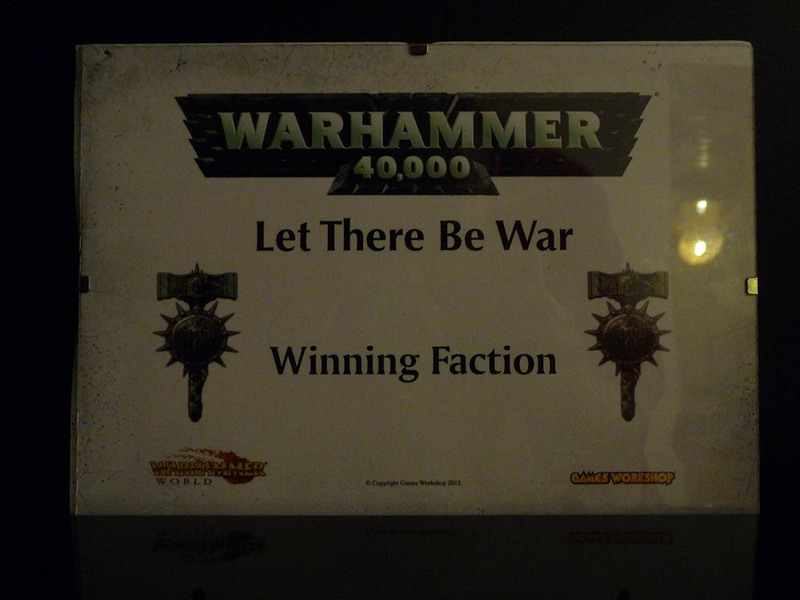 After this there is only one more set of pics from Warhammer World you'll be happy to know. 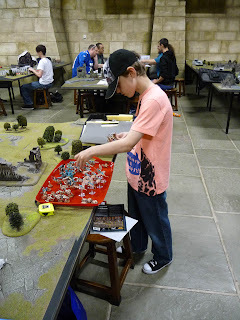 I took some shots of my son gaming but I keep asking him to write something to go with them, a little guest post, maybe a mini-report in places. I'll bully him into doing yet! 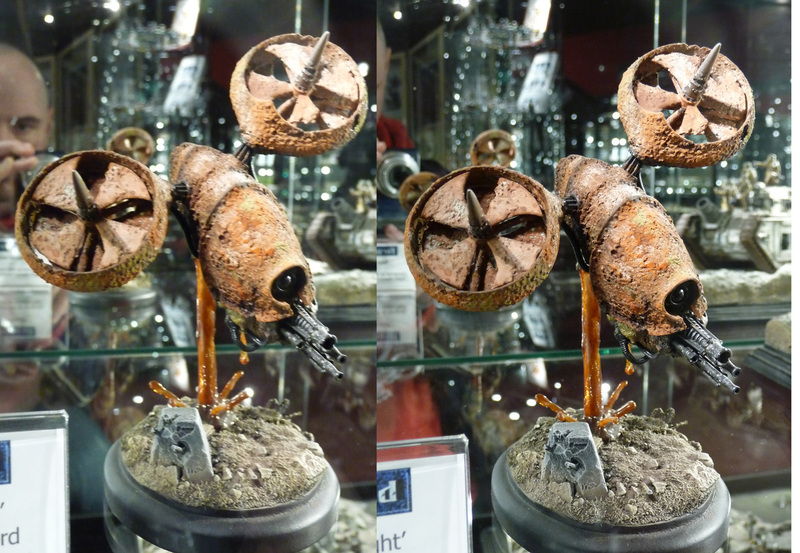 In the mean time how about some 3D, no glasses required except perhaps afterwards if ti screws up your eyes! You may have noticed I took an awful lot of pictures [and a lot of awful pictures too] quite often I would take one picture only to see in the preview that it was slightly blurred so I would take another shot to get a crisp image. The unexpected bonus to this was that I suddenly realised the other day that I had the makings of some 3D Stereogram images. If you recall they were very popular in the 90's mainly the 'noise' variety where if you held the page in front of you and crossed your eyes in a particular way eventually you would suddenly refocus and the noise would coalesce into some 3d shape hidden within the patterns. You can do the same thing with slightly offset imagery, just like the pics I had taken. Some work better than others but once again the best thing to do is click the pictures below to see them at full size then go a bit cross-eyed and try to bring the two images into focus in the middle of the picture. 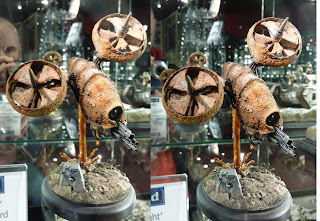 If you get it right there should be some 3D shenanigans, so here's the Blight Drone, which is an awesome model and one of the best 3D images. One of the Forgeworld large scale marines. Lurtz the Uruk-hai who guards the entrance to Warhammer World. 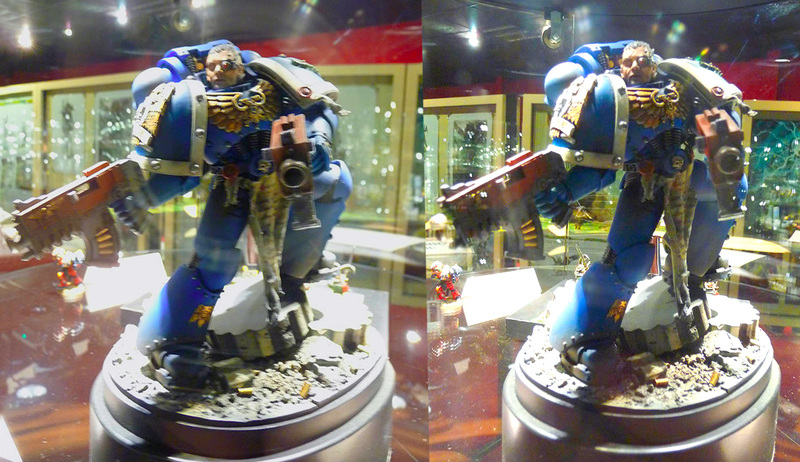 When viewed properly I think this is more 3D than the real thing! My son refused to have his picture taken with him, which is one of the 10 things you are supposed to do when visiting Warhammer World. 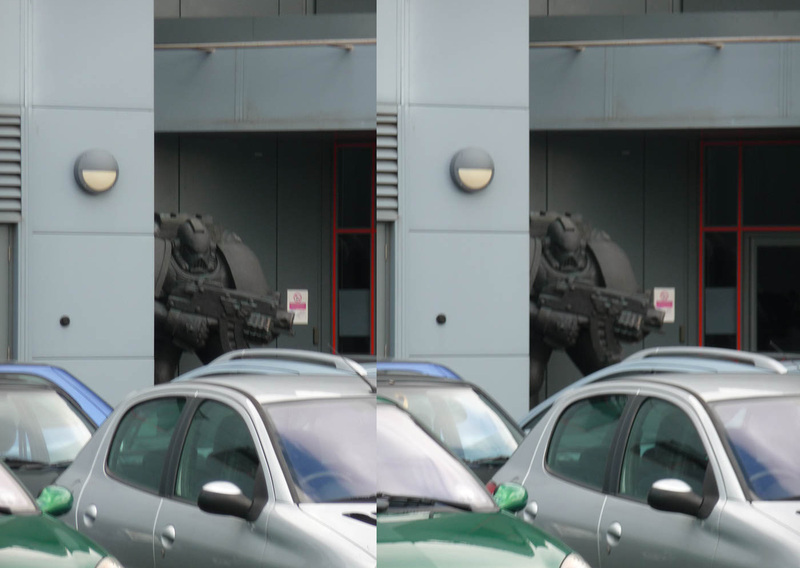 Be careful when you enter Warhammer World as this Marine guards the building opposite. 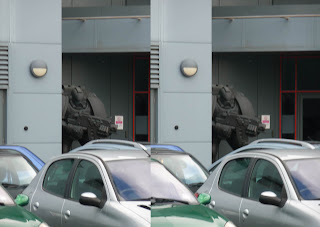 You may have seen pictures of the statue that stands outside the front of GW headquarters. 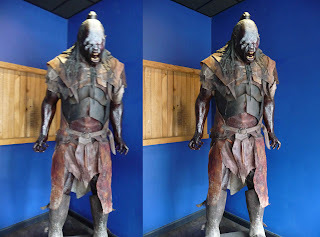 This is his brother who has a rather less glamorous location but slightly more disturbing when you see him poking round the corner of the car park watching for ne'er do wells and xenos of course. Now in case you're having problems seeing these I turned a couple in flick movies so perhaps you can see the 3D a little bit easier. 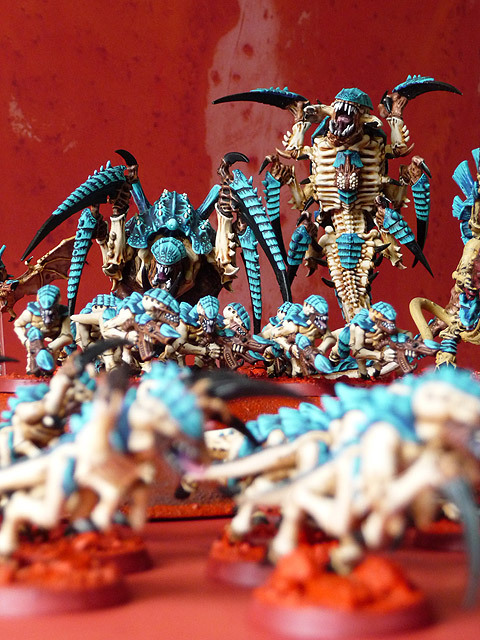 Having suggested many different ways to add detail, but in so doing increase time to model I ended up with just some string tentacles on the backs, just to make them a little more organic and alien. You can also see that the grey-board bases have warped just a little bit after being based with sand. Not enough to be a problem but I thought I'd draw attention to it. Sand also got added to the fronts, I'm hoping to transition between the chitin and the ground without too much stupid contrast, if you follow. As a group they're really starting to come together and I think the alien tentacle vines break up the slightly shoddy sculpting on the back. I hope the paint job works because right now they look decent enough as is, ha, ha! And the quad gun in place, still visible over the defence line. 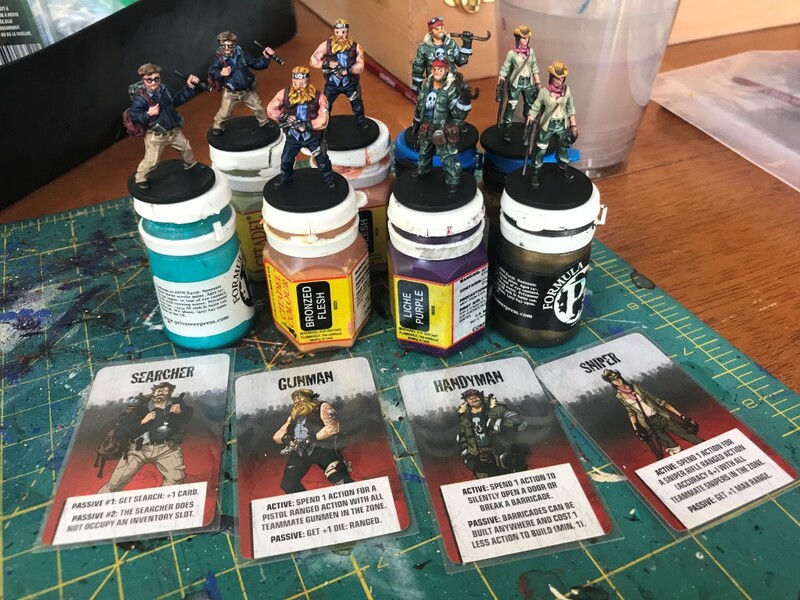 But still capable of gaining a cover save ;) Next up base coats.